"When everything else has fallen apart, Victor von Doom finds his time to shine. After taking control of a massive cache of energy, he restores the universe as best as he can, becoming its creator and unquestionable ruler - the God Emperor of Battleworld. Even armed with omnipotence, Doom remains cautious, relying on only a trusted few to advise and execute his vision. Is his paranoia just a hazard of the job, or do old enemies still haunt the shadows?" 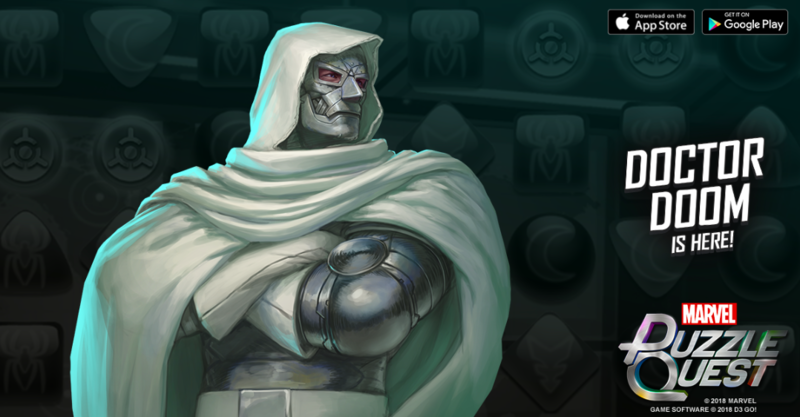 Check out the brand new 5-Star Doctor Doom, and find out how you can recruit him onto your roster! Doom rebuilds his world, keeping his closest allies right where he needs them. Heals allies for a burst of 3230 health and completely reshuffles the board. Doom made you, and he can unmake you. Drains up to 1 friendly Red, Green, and Purple AP and deals 12211 damage. (PASSIVE) If Doom is Downed, all enemy Strike, Attack, and Protect tiles are removed from the board. Level 2: ...deals 13590 damage. Level 3: ...deals 14970 damage. Level 4: ...deals 17728 damage. Level 5: ...deals 23245 damage. Doom seizes anything that might pose a threat to his sovereignty. Whenever the enemy makes a Black or Yellow match, steal 1 AP of that color and heal Doom for 2524 health. Level 2: ...heal Doom for 2776 health. Level 3: ...heal Doom for 3029 health. Level 4: ...heal Doom for 3534 health. Level 5: ...heal Doom for 4543 health.